Dish towels for Larry. 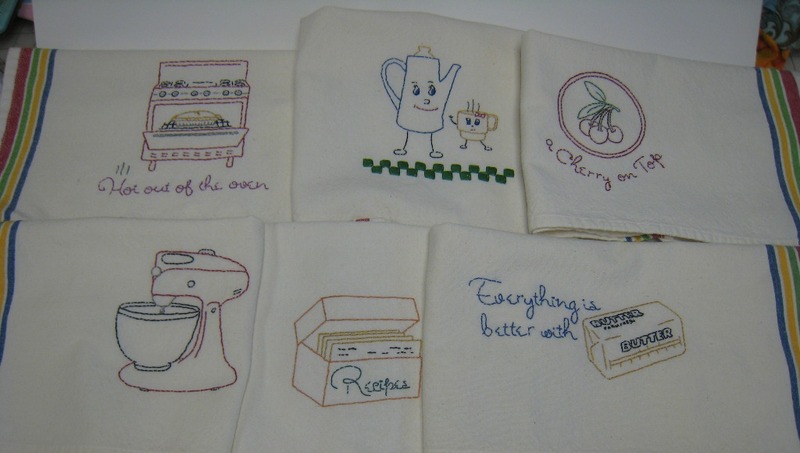 That’s really all he wanted for his 60th birthday was some hand embroidered dish towels. Well I can certainly pull that one off! So for a month every night well most nights when I watched TV I worked on dish towels. Larry had watched me work on dish towels before Christmas when I was making them for friends and that’s when he decided they were really cool and he wanted some of his own. I did some different patterns on his than I did on the Christmas ones. He really loved the coffee pot and coffee cup one that I had done for a friend so I did that one and the rest were different. I used a hot iron transfer like this one Stitcher’s Revolution and ironed them onto Aunt Martha’s Vintage Dish Towels . Hurray, the dish towels for Larry were done in time for his birthday. They were fun to do and Larry was pleased!